This is the client. It is the interface through which you play the game world. Let's take a moment and explore each section of the client. This is the output window. New output will appear from the bottom and scroll up. You can see your scrollback history by using the page-up and page-down keys, by using your mouse wheel, or by clicking on the button in the upper right of the client. You can adjust the location where the split screen happens with your mouse. You can close the split screen by clicking on the HIDE button in the top right. This is the command input line and is where you input commands to the game. These are the F-Key buttons, which come pre-filled for new characters. You can edit these keys in settings menu, which is accessed from the gears icon in the lower-right. You can activate the buttons by clicking on them with your mouse it pressing the corresponding F-Key on your keyboard. 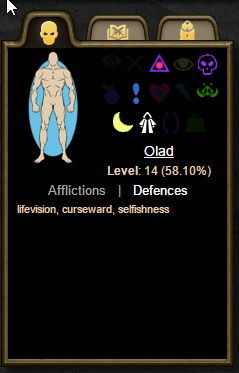 Above that you’ll see indicators for health, mana, and other stats, depending on which Iron Realms game you’re playing. To the left of the gauges are the balance and equilibrium indicators. The hammer icon indicated your balance. The star indicates your equilibrium. To the right of the gauges is your character portrait. This is initially set by default. You can select one of ours or upload one of your own by clicking on it. In our game worlds your character is in a room. You move from room to room by typing in directions like north or southwest. This map window indicates the room you are currently in with a flag. You can also move by clicking on the exits listed in the map window, or by double clicking on a room. 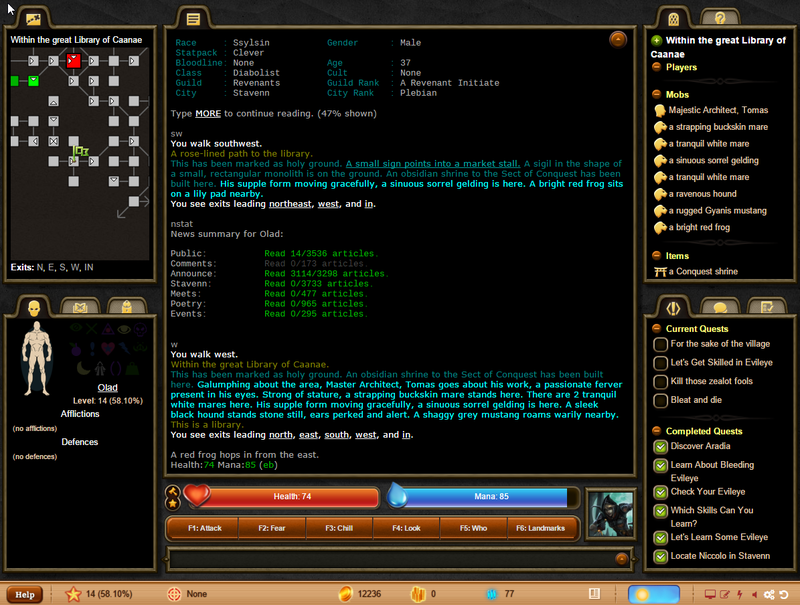 You can also move by using the Map Compass which appears in the top right corner of your main output window. This is off by default, but can be turned on in your settings. That is the character window. As you get damaged, your limbs, body, and head will change colors (not all of our games have this concept). 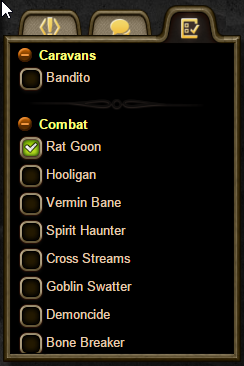 To the right are icons representing different common defenses that your character may have active. 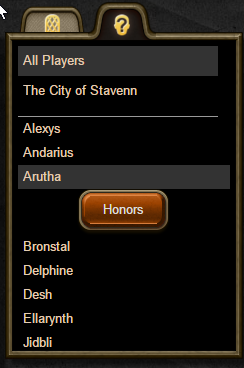 You can mouseover them to see their names, and get more info in-game. Below that you’ll see other kinds of info, as well as a complete list of the afflictions and defences you currently have. 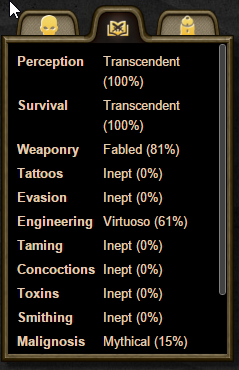 The skill tab displays your current skills. 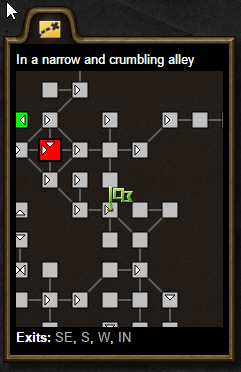 Clicking on a skill will popup a display of all your abilities in that skill. This displays your inventory. 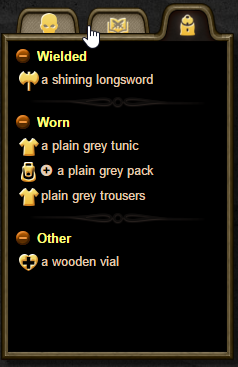 Breaking it down by items you are wielding, wearing, and carrying. This is the room tab. It displays all of the items in the room. 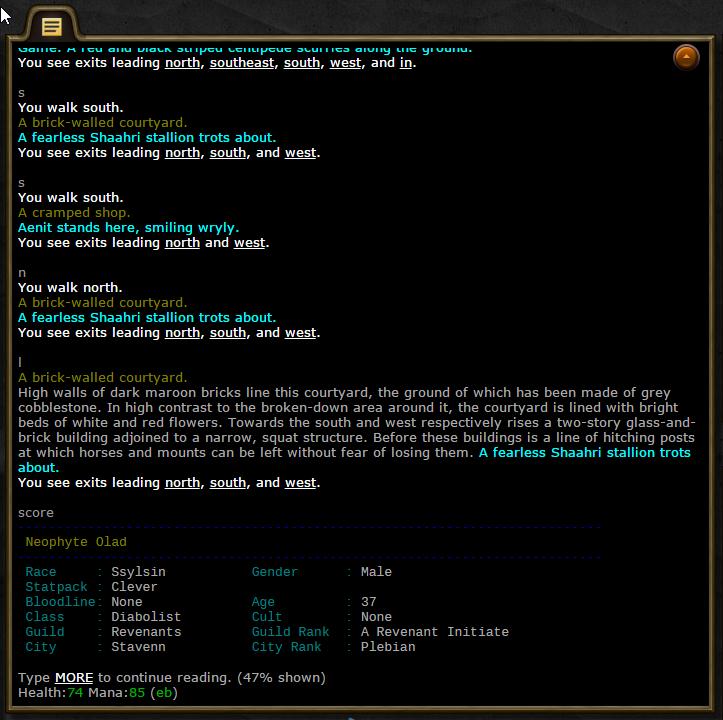 It is broken down by other players, mobs (these are NPCs and monsters), and items. This tab lists all of the current players in the game that you can see. You can also click on any organization you belong to for a filtered list. 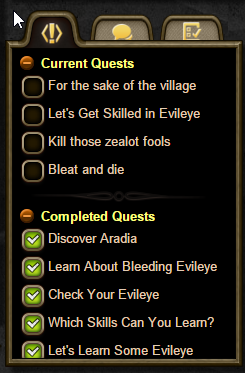 These tabs display any quests, tasks, and achievements you may accomplish. You can click on the task for a popup to display any information about that task. 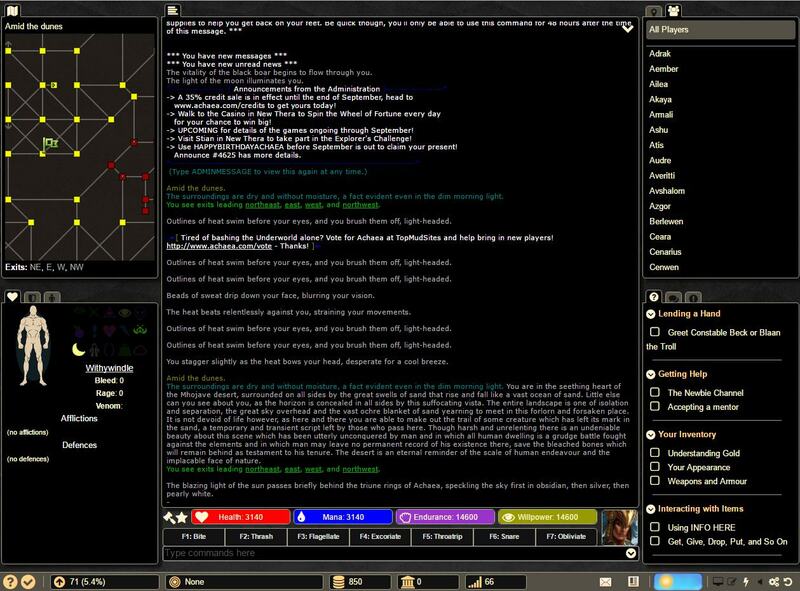 Not all of the Iron Realms games use all of these activities. 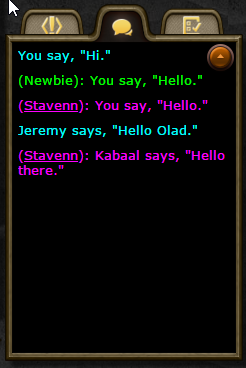 All chat communication you receive in the game is piped to this window. The status bar is located at the bottom of the client. Help: Click this button to access this wiki. Vote: Click this button to vote for your favorite game on the TopMudSites website. Level: This star icon indicated your level and how far you have progressed to the next level. 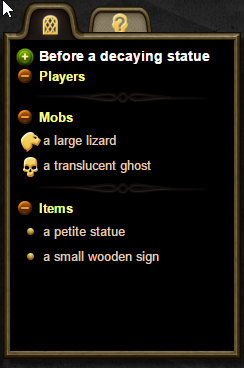 Target: What player or mob you are currently targeting. Gold: How much gold your character is carrying. Bank: How much gold you character has in the bank. Ping: How fast is your connection to our servers. The lower the number, the better. Messages: If the envelop icon is visible, you have a message. 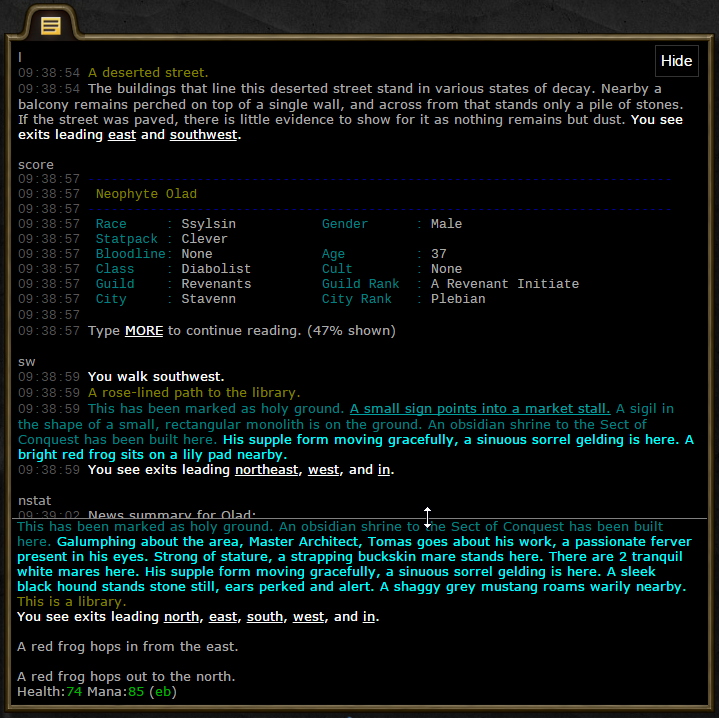 Type HELP MESSAGES in the game for more information. News: If the news icon is highlighted, you have unread news. Type HELP NEWS for more information. Day/Night Indicator: This indicated the current time of day in the game. Hovering your mouse over the icon will display more information. Fullscreen Mode: The monitor icon will cause the client to run in fullscreen. Logging: You can log all output from the game to a text file for later use. Scripts On/Off: The lightning icon will turn on and off all of your reflexes. Settings: The gear icon will open another window, allowing you to adjust your settings. Reset: You can reset the client to its default layout by clicking this icon. This page was last modified on 19 September 2016, at 19:51. This page has been accessed 124,988 times.